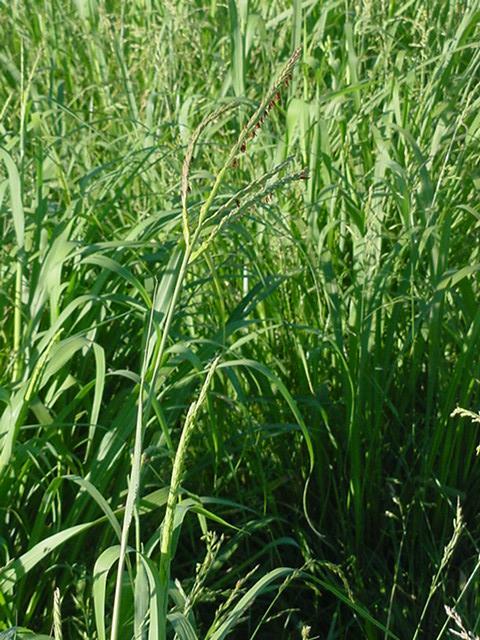 Rich, nutrient-dense grass on John Wood's farm—the perfect food for cattle. I was in a hurry Saturday afternoon. I had to make a pot roast, but I had very little time. So I decided that we would settle for a meal that was good and nutritious, but simple and easy to prepare. I browned the grassfed roast in grassfed beef suet, took it out of the pan, and browned an onion and some shallots in the drippings. I returned the roast to the pan, added some water, salt and pepper, covered it, and stuck it in a low oven. The whole procedure took about ten minutes. Several hours later, we ate what I thought would be a mediocre but acceptable pot roast. I was wrong. 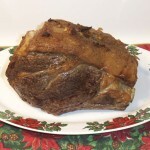 The roast was absolutely delicious, with a wonderful rich flavor, and a great texture. We all remarked on how wonderful it was. I was shocked that it tasted so good. After thinking about it, I realized what made the meal so wonderful—the quality of the ingredients. But why were the ingredients so good? After all, all the meat we eat is grassfed, and all the vegetables we eat are organic. After some thought, I realized that all the ingredients came from farms that had particularly great soil, from farmers who really cared about the quality of their food The lesson I learned is that even in the world of real food, some food is exceptional. Every plant and grass gets its nutrition from the soil—the richer the soil, the more nutritious the plant. Grassfed cattle get their nutrition from the grass. Grass growing in rich soil makes great feed for cattle, resulting in great flavor and nutrition, and fatter cattle, which are more tender and flavorful. Factory agriculture depletes the soil, relying on chemicals and artificial fertilizer to produce plants that are far inferior to plants grown on rich soil. Yet even good soil is not as desirable as great soil. The roast came from U.S. Wellness Meats. I have been ordering grassfed beef from U.S. Wellness Meats regularly since August 2006. They sold me the first grassfed meat I successfully cooked. Their meat was excellent then. The business has grown a great deal since 2006, and the quality of the meat has changed. It has become steadily better, more tender, more flavorful, more energizing. While the quality of most companies’ products suffer as they grow bigger, U.S. Wellness Meats is an exception to the rule. I credit the fact that their meat is getting steadily better to their founder, John Wood, who constantly takes measures to improve the quality of the soil on his farm, and to raise even better meat. This blog post I did on how John is improving the soil on his farm shows how he did it: Grassfed Farmer Renews the Land. The improving quality and terrific flavor of his already superb meat show the results. The wonderful natural flavor of the meat was a huge factor in producing this easy, yet delicious roast. There is a farm at our local farmers market. A couple months ago, I passed their stand and was struck by the beautiful vibrant color of their organic Italian peppers. We already bought our produce from another organic farm in the market, and were very happy with their produce, but these peppers looked so wonderful, I bought a few. After sautéing the peppers simply, we were completely blown away with their incredible flavor and pleasing texture. And we felt good after eating them, a feeling I usually get only when eating grassfed meat. Next week, we stopped at the stand, and bought all kinds of gorgeous produce. I talked to the farmer, and told him how much I enjoyed the peppers. He said, “This is the food I feed my family.” He said it seriously, with pride and satisfaction, as if feeding his family was the most important thing in the world, and it was his duty to do it well, and he knew he was doing his duty. We talked a bit more, and he spoke about the natural measures he took to improve his soil, which he did every single year. No chemical fertilizer or pesticides for his family! No wonder his produce was so wonderful. The onion and shallots came from his farm, and their rich complex flavor blended perfectly with the fantastic meat from U.S. Wellness Meats. All factory foods taste pretty much the same. Factory beef has the same flavor, no matter where it comes from. All factory vegetables taste pretty much the same as well. But grassfed beef had a wide variety of tastes, and grassfed beef from cattle raised on healthy grass growing on rich soil has incredible flavor and tenderness. Organic or the equivalent vegetables also vary widely in flavor, but the very best comes from those wise farmers who improve their soil. When you eat food of this very high quality, even a simple, easy recipe can result in a magnificent meal. The recent confiscation of a four-year-old’s homemade lunch, which resulted in her being given chicken nuggets instead, has outraged people all over the United States. Many comments on the Internet have made it clear that this is not an isolated incident, but that many similar actions have occurred, not only in preschools, but in elementary schools as well. The Federal government is attempting to dictate what constitutes a healthy meal, and what every child should eat. While the intent might be good, the execution is a disaster, as flawed standards are dictated, and these standards are required for every child, regardless of their individual needs. The basic human right of parents to select food for their children is completely ignored. The inevitable result is that the children are much worse off, because their needs as individuals are ignored. Each serving size is set at three ounces. No mention is made in the standards as to the quality of the food. The government standards treat all food as being of equal quality, and demand the same lunch for every child. The truth is that every kind of food varies greatly in quality, from heritage organic foods raised on small sustainable farms (the best), to factory foods raised on huge factory farms that are lacking in many vital nutrients, and are full of pesticides and other chemicals, often containing GMOs and soy protein isolate (the worst). The government programs often mandate that the cheapest source of the required foods be selected, which guarantees that the worst quality food is selected for government-financed food programs. Yet the government insists that each lunch must contain the required servings, and ignores the issue of quality. The incident that sparked so much outrage deserves a close look. A four-year-old preschool student brought a lunch prepared for her by her family. The lunch included a turkey and cheese sandwich, a banana, a bag of potato chips, and some apple juice. Her lunch was INSPECTED, by some kind of official. This resulted in the child being told that the lunch her family packed was not good enough. She was told to put the home lunch away and to get a cafeteria lunch. The only portion of the cafeteria lunch that the child actually ate was three chicken nuggets. The nuggets, since they had to be the cheapest available, almost certainly were made from slaughterhouse scraps treated with ammonia, the infamous pink slime. Soy protein isolate was almost certainly added to this mix, along with artificial flavor enhancers and who knows what else. Does anyone seriously contend that this child got a better lunch than the one her family packed for her? By trying to force the child to eat the one-size-fits-all government lunch, the government deprived her of a good lunch and caused her to have the equivalent of no lunch at all. In fact, government interference resulted in her having a truly inadequate lunch, rather than the much more nutritious lunch packed for her by her family, consisting of foods that her family knew she would eat. The incident was later blamed on “teacher error,” by a school district administrator. Yet even this administrator said the child should have been given a container of milk. This must have been the cheapest possible low-fat or non-fat factory milk. What if the child was allergic to milk, as so many children are? What if her parents did not want her to drink that type of milk? What if milk gave her indigestion? What if they wanted her to drink only high-quality organic milk? What if they did not want her to drink milk at all? What if they knew the child would not drink milk, but would eat the cheese they put in her sandwich? The point is, the government does not know any of these details, and does not appear to care. To them, one-size-fits-all, every child gets a carton of factory milk, whether they or their parents want it, or not. Whether it is good for the child, or not. That is exactly why the government should not be making food choices for children, why parents know best, and why one size fits NOBODY, when it comes to food. 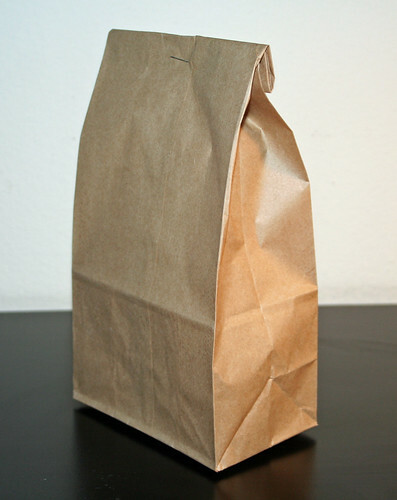 Here is a link to a great post by my friend, Kimberly Hartke: Keep America Safe for Brown Bags! 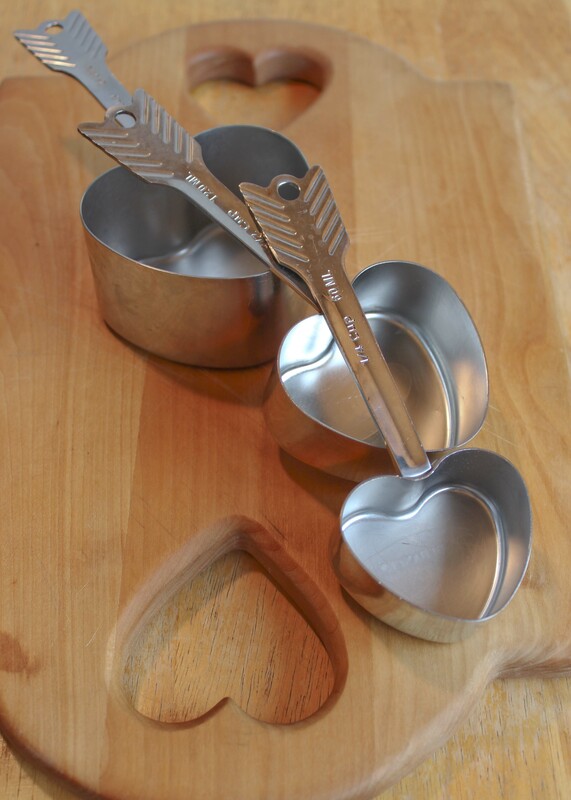 Heart-shaped measuring cup for romantic scoops on Valentine's Day! It has long been a custom to give your loved one candy as a gift for Valentine’s Day. A very profitable custom, with a whole industry built around it. Boxes of sugar-soaked chocolates are particularly popular. I used to do this, until I learned a lot more about nutrition. I submit that it is not romantic to give your loved one an overdose of addictive, harmful sugar. Processed sugar is bad for people, period. Grassfed meat is one the most nutritious foods you can eat, improving every bodily function, and providing extra energy and vitality. So what do I give instead? I give a gift of delicious grassfed meat, with a bit of a Valentine’s touch. One year I had the butcher carve a beautiful grassfed rib steak for two into a heart shape, which was especially delicious. The next year I trimmed two strip loin steaks so they formed a heart shape, and held them together with skewers made of Rosemary branches. The branches provided a wonderful rosemary flavor to the meat. The next year we had a heart shaped sirloin steak that was covered with a red marinade, made of pureed tomatoes and peppers, with paprika and other powdered red peppers. So delicious! This year, I am going to carve some heart shaped depressions in a grassfed tenderloin roast, and fill them with finely chopped mushrooms sautéed in plenty of butter. I will then cover it with a homemade mushroom butter before roasting. I think that will be delicious, also. It is also a custom to go out to a restaurant on Valentine’s Day, which is a great benefit to the restaurant industry. It is almost impossible to get a great real food meal in a restaurant anymore, so we enjoy a much better meal at home. I find great joy in cooking the Valentine’s dinner myself, using the money we would otherwise spend in a restaurant to buy a special cut of meat for the occasion. Finally, we will have more mushrooms, sautéed in plenty of real butter. You cannot have too many sautéed mushrooms. Or too much butter. If this seems over the top and sappy, it is, but it is also a lot of fun. And so delicious! What can I say, I am a romantic. But my wife does not mind. She is also a romantic. Lucky for me. This post supplements the three-part article I did on the traditional diet of the Scottish Highlanders, their prowess in battle, and how the traditional Highland way of life was destroyed by the industrial agriculture of the day. The three-part article was posted on the excellent Hartke Is Online blog, and links to the articles are posted below. Unlike other Europeans, the Scottish Highlanders had plentiful meat in their diet. The traditional Highland diet, described in Part 1 of the three-part article, also had a valuable feature that was missing from almost all the other diets eaten in Europe—free access to meat, wild game, and wild fish. 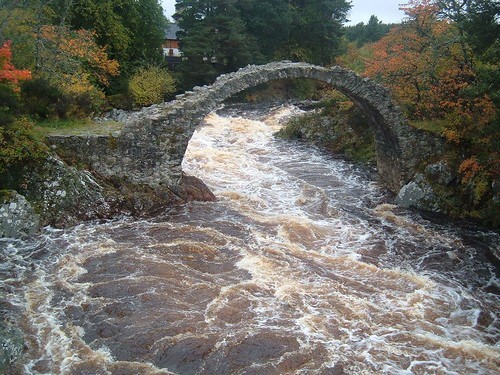 Under the traditional system in the Scottish Highlands, the land was owned by the clans, though its use was given to individual families within the particular clan. Everyone in the clan could hunt the wild game that was so plentiful in the spring, summer, and early fall. Everyone could fish in the many small rivers, ponds, and lakes, which were full of wild fish most of the year. Every Highland farmer could kill some of his herd animals and salt their meat in preparation for the long winter. Though the death penalty was removed from anti-poaching laws in the nineteenth century, armed gamekeepers prevented most Europeans from hunting. Meat remained very expensive and usually unaffordable for most people, who were condemned to eat a diet consisting mostly of grains and vegetables. Many Europeans immigrated to the United States because they heard that even the poor could afford meat there, and hunt. This post is part of Monday Mania and Fight Back Friday blog carnivals. This beautiful grassfed New York tip roast was cut by master butcher Robert Webster. My first cookbook, Tender Grassfed Meat, often refers to a “fat cap.” After the book was published, and I started to get questions from readers, I realized, with shock and dismay, that many people did not know what a fat cap was. When I was a teenager, every roast and steak had a fat cap, and it was common knowledge that this fat added great flavor and kept the meat tender. This once common knowledge has now been largely forgotten, because of government and industry propaganda that demonized one of the oldest and most nutrient-dense foods of humankind. Yes, saturated animal fat from grassfed or pastured animals is one of the most nutritious foods you can eat. (The Skinny on Fats) It certainly does wonderful things for cooking grassfed meat, keeping the meat from burning, keeping the meat moist and tender, adding wonderful flavor that just keeps getting better as the meat cooks. The demonization of animal fat has been very effective. Most butchers and markets trim most or all of the visible fat from the outside of their meats. Most recipes and cookbook authors tell people to trim off all the visible fat on the meat, in the unlikely event that the butcher missed any. This result of this ludicrous practice has resulted in many people who have never even seen a fat cap. 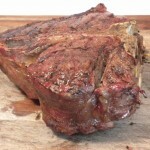 A fat cap can be described in words, but this is one of those cases where a picture really is worth a thousand words, so the photo at the beginning of this article is of a New York tip roast (also known as rump cover or Picanha), with a proper fat cap. The white substance on top of the meat is a fat cap, and a magnificent one. The fat varies in thickness from one quarter to one half inch, which will make for a wonderful roast. One quarter inch is the minimum for a proper fat cap. In addition to making the meat tender and tasty, the fat cap makes great eating. Yes, I actually eat some of the fat with the meat, like all traditional peoples used to do. Just about all traditional peoples ate fat with meat, and so do I. 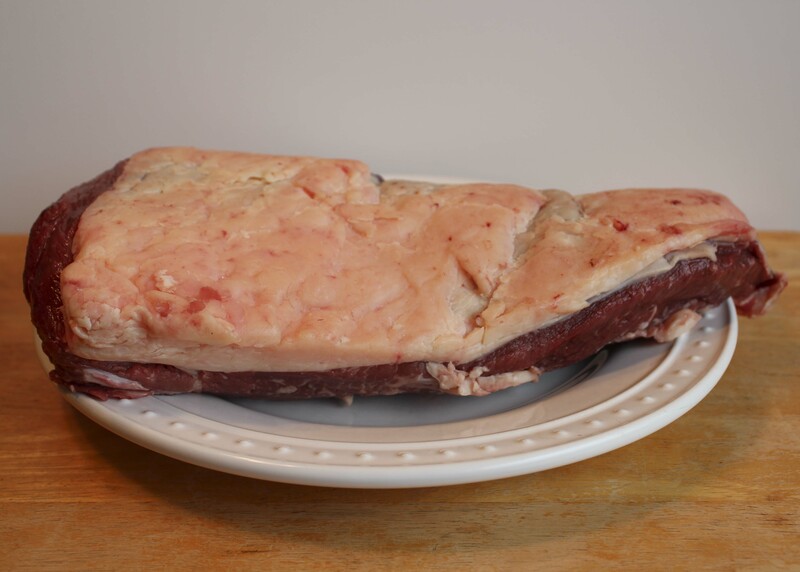 Every roast, steak, pot roast, stew, pan roast, and hamburger I make will have some animal fat on it or in it. The meat tastes much better that way. I will always roast some vegetables in the pan with a roast like this, as the melting fat will give them a nice crust and incredible flavor. I do not use roasting racks, since they make it difficult to add vegetables to the pan. Instead, I place the roast on some vegetables that serve as a rack, and can be eaten with pleasure once the meat is done. This technique is used throughout Tender Grassfed Meat. My biggest problem in buying grassfed and pastured meats is to get the producer to leave a proper fat cap on the meat. I am having more success with this, as the truth about the nutritional value of grassfed fat is slowly being rediscovered.